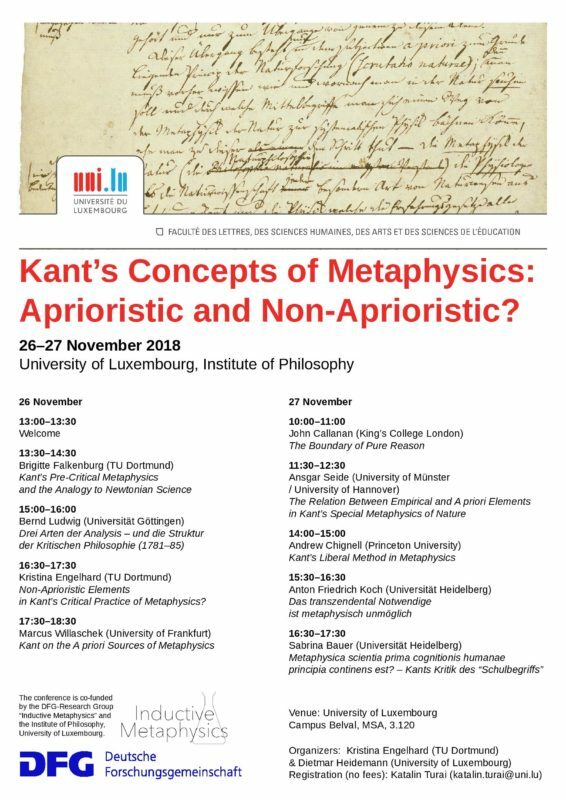 We are glad to give notice that the conference “Kant’s Concepts of Metaphysics: Aprioristic and Non-Aprioristic?” will take place at the University of Luxembourg (MSA Building, Room 3.120) on November 26th and November 27th, 2018. The list of the speakers includes Brigitte Falkenburg (TU Dortmund), Bernd Ludwig (Universität Göttingen), Kristina Engelhard (TU Dortmund), Marcus Willaschek (University of Frankfurt), John Callanan (King’s College London), Ansgar Seide (University of Münster/University of Hannover), Andrew Chignell (Princeton University), Anton Friedrich Koch (Universität Heidelberg), Sabrina Bauer (University of Heidelberg). Here below and at this link you can find the poster and the schedule of the conference.